Booking a comfortable hotel is a quite necessary thing before your journey. A nice hotel will bring a nice stay. 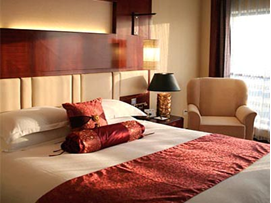 This essay will tell you about Yiwu SSAW Huafeng hotel, another good choice in Yiwu. This 4 star hotel located near the city center, it is quite convenient to go the airport and international trade city. There are 180 well decorated and specially rooms in the hotel. You can get free broadband, LCD TV, hair drier in each room. The hotel offer free breakfast also. When you finish a day-long work or business, you can have a drink in the bar, or have a sauna, spa, or flourish foot massage. Also, you can enjoy laundry service, use meeting rooms, freely parking. But you should remember that you are not allowed to bring a pet with you. You can pay for the cost with VISA, Union Pay, and Master Card. Yiwu SSAW Huafeng Hotel will make you trip comfortable and convenient. Feel free to get other information from us. There is much other Yiwu hotel, if you need booking hotel in Yiwu, please feel free to contact us.